On 5 December 2016, the Paul Scherrer Institute PSI held an inauguration ceremony for its new large-scale research facility SwissFEL, with Johann N. Schneider-Ammann, President of the Swiss Confederation, in attendance. Scientific breakthroughs the Swiss free-electron X-ray laser is expected to generate will drive important developments in the areas of energy and environment, information technology, and health. "SwissFEL is the most ambitious project that we have ever undertaken at PSI", said PSI Director Joël Mesot, who opened the ceremony – a project made possible not only through the commitment of PSI staff but also with vital support from industry, which delivered the key components for SwissFEL, as well as from politics at every level, from the federal to the cantonal and municipal levels. As a special sign of gratitude to the municipality of Würenlingen, in whose forest SwissFEL was constructed, Joël Mesot presented Mayor André Zoppi with a so-called "copper cup" from the linear accelerator, one of the high-precision components that industry produced for SwissFEL. André Zoppi, too emphasised the positive cooperation, adding: "The municipal council offered the PSI its cooperation on the basis of the magnitude and importance of the SwissFEL project." Currently one of just four such facilities worldwide, SwissFEL will play an important role in international research. "As the Swiss Light Source SLS already does, SwissFEL will attract leading researchers from Switzerland and the whole world", the next speaker, Roger Falcone of UC Berkeley, is convinced. "Today is one of the most beautiful moments since I took office", said the visibly moved Aargau Government Councillor Alex Hürzeler, as he emphasised the benefits of SwissFEL for Aargau as a high-tech hub and for Switzerland as a whole: "SwissFEL contributes to our ability to reinforce the positioning of Switzerland as an innovation engine." At the same time, though, he stressed that staying on top in a competitive world requires constant effort. What needs to be done to maintain and further enhance Switzerland’s world-leading position was the topic of the subsequent panel discussion, titled "Research and innovation are central factors for Switzerland’s future. Are we doing enough?" Taking part in the discussion, moderated by Beatrice Tschanz, were Peter Allenspach, member of PSI’s board of directors, leadXpro CEO Michael Hennig, Aargau Government Councillor Urs Hofmann, Alpiq CEO Jasmin Staiblin, and Fritz Schiesser, president of the ETH Board. Their shared sense of the matter: What’s required are the right framework conditions for the buildup of research infrastructures like SwissFEL, close cooperation between research and industry – as will be promoted for example by PARK INNOVAARE, located at the PSI – a commitment to fundamental research as the basis for disruptive ideas, and also the courage to support innovative ideas at an early stage. In an address following the discussion, Federal President Johann N. Schneider-Ammann also stressed the importance of research and innovation for Switzerland. He compared the Swiss free-electron X-ray laser SwissFEL to the Gotthard Base Tunnel, likewise opened in 2016: "Both tunnels are regarded as technical masterpieces, both tunnels embody Swiss know-how, and with both tunnels we are venturing into new territory." Switzerland places great value on excellent infrastructure, he said – one of the reasons Switzerland regularly occupies top spots in innovation rankings. 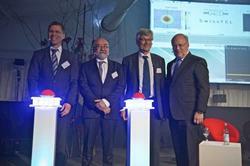 Afterwards, SwissFEL project leaders Rafael Abela and Hans Braun led guests through the inauguration ceremony. "After many years of planning, construction, and installation, a new SwissFEL era is beginning at PSI: The time of the scientific harvest is at hand", Abela said. 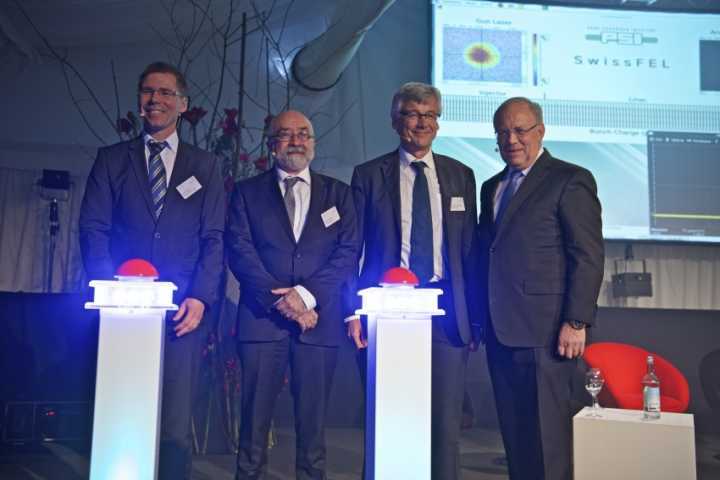 As the climax, Federal President Johann N. Schneider-Ammann and PSI Director Joël Mesot together "pressed the red button" symbolically launching the Swiss free-electron X-ray laser SwissFEL into operation. SwissFEL belongs to a new generation of X-ray light sources. Free-electron X-ray lasers generate very short pulses of X-ray light with the characteristics of laser light. With SwissFEL, researchers will be able to observe extremely fast processes such as the formation of new molecules in chemical reactions, determine the detailed structure of biologically important proteins, and clarify the precise composition of materials. The first pilot experiments are planned for 2017. The costs of SwissFEL amount to around 275 million Swiss francs and are largely borne by the federal government. Canton Aargau is also participating in the financing with 30 million francs out of its Swiss Lottery funds.